Grease a baking pan and put about a third of the filo pastry in the bottom. Brush well with the melted butter. Combine nuts, 1/2 cup sugar and the cinnamon and sprinkle over the filo pastry. Repeat twice. Cut into diamonds and bake at 200C for 30 minutes or so until brown. Meanwhile, in a saucepan, combine remaining 1/2 cup sugar, honey, water, and lemon juice; bring to a boil. Boil baklava syrup for about 20 minutes, stirring occasionally, until syrupy. Cool and pour over baklava. Here is a link to an English Russia article on how to make baklava. Preheat the oven to 150° C [300° F]. Mix the oil and sugar until well blended and add in the beaten eggs. Mix in the flour and salt and then add the chopped cranberries and the pistachios. Form the dough on a flat baking tray, into two rectangles approximately 10 cm wide by 30 cm long and 1cm thick. Bake for 45 minutes or until light brown. Remove from oven, and set aside to cool for 10 minutes. Reduce the oven temperature to 135° C [275° F]. Cut the baked dough on a diagonal into 2cm wide strips. Lay on their sides and re-bake for about 10 more minutes or until they are dry and crisp. 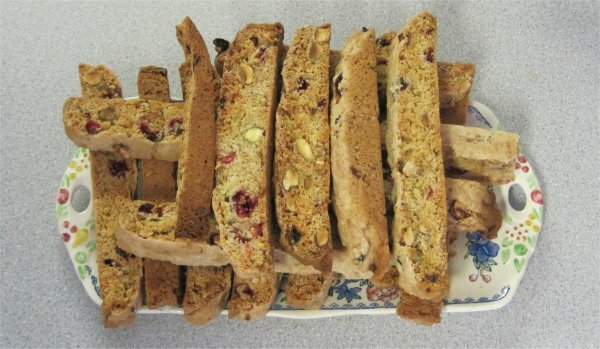 Biscotti and biscuit have the same route, meaning twice baked. Make the pastry case following the instructions in the pastry section, or mix crumbled digestive biscuits with some butter and mould into a baking tray [This is the unhealthy option! ]or buy one ready made! Mix the cornflour with a little water in a mug to make a smooth paste and then add to the rest of the water and the sugar in a pan and heat until the mixture thickens. Remove from the heat and add the beaten egg yolks and lemon juice. When well mixed pour into the pastry case. Beat the egg whites until they are stiff and then slowly add the caster sugar a bit at a time, whisking the while. Spread over the lemon filling. Bake in a cool oven 360° F, 130 C for 40 to 50 minutes by when the merangue should be crisp but not browned, and has a squishy texture inside. This was a favourite with my sister, and my mother could never get the merangue to stay crisp. Since we have central heating and lower humidity this is no longer the problem it used to be and the pies will stay crisp if NOT put in the refrigerator. I rather think that I prefer them soggy but this is a matter of taste. Put the batter into a polythene bag and cut off one of the bottom corners of the bag with scissors. [about a 0.25cm hole]. Heat some high temperature oil in a frying pan, about 1cm deep and squeeze some of the cruller mixture into it. Make the traditional pretzel knot shape or, errrrr some other shape 'to taste'. When cooked, drain the oil, sprinkle with icing sugar and drip with lemon juice. Allow to cool and eat with an ice cold vodka chaser. If you make the batter a bit thicker, you have the mix for blinnis. Pour a few tablespoons into a well oiled frying pan and turn over when the first side is done. Keep warm on a plate on top of a pan of boiling water covered with a tea towel. Serve with caviar, smoked salmon and sour cream. Doing my recent update of the website [Jan 2010],I was surprised to see this recipe as I don't think I have used it in years. Blinnis have featured in several Christmas and New Year celebrations recently and I have used buckwheat flour for these. I've been a bit curious to find out just what buckwheat is. To my surprise, it turns out that it has nothing to do with wheat and is milled from the seeds of sarrasin, a member of the rhubarb family. It is therefore, gluten, wheat and nut free. Get the yeast going as for bread, then add the well beaten eggs and the milk/beer mix. Mix well and allow to hang around for a bit then fry up as described above. This year, I made 'mini blinnis' [with a thinner batter mix] which were much preferred to the rather more substantial full sized ones. This used to be very popular with tw and sj as a boat based dessert. Cut fresh peaches in half and remove the stones. Place cut side up in a pyrex dish and place under a high grill until the peaches show signs of browning. Remove and sprinkle liberally with sugar and dowse with cheap brandy [or something]. Return to the grill until the sugar starts to caramelise or the brandy bursts into flames or both. One summer spent near Toronto, we used to buy Izzy's sand tarts from the local bakery. These were just like my mother's syrup tarts only a bit deeper. Put the syrup into a saucepan with the bread crumbs, lemon rind and juice and heat gently until just melted. Cool. To get a more 'sandy' texture, fry the breadcrumbs in a little oil or put under the grill before use. Roll out the pastry and line a pie dish with it. Pour in the syrup mixture. Roll out the pastry trimmings and cut into long, narrow strips. Arrange them in a lattice pattern over the filling. Bake in a moderately hot oven (400° F, 200 C) for 25 to 30 min or until the pastry is slightly browned. Spread pecans in an unbaked pie shell. Bake at 375° F, 140 C for 40 to 50 minutes or until filling is set. 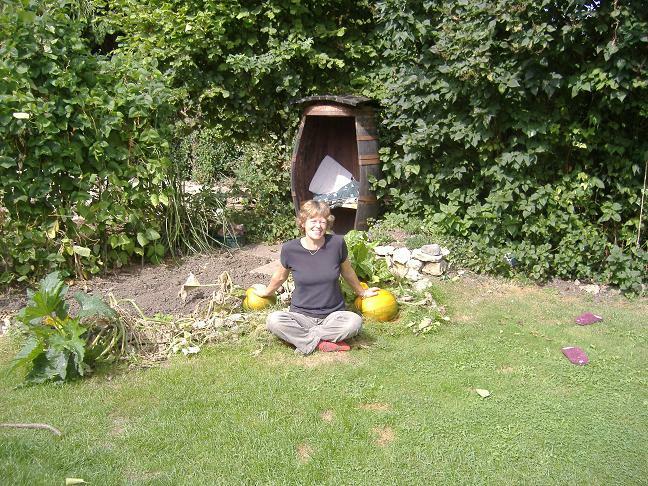 This year  we grew pumpkins in the veg patch and have two nice ones ripening in the autumn sun. And this was their ultimate fate!!! This has prompted us to plan a thanksgiving dinner and I'm gathering together my recipes for a traditional feast. 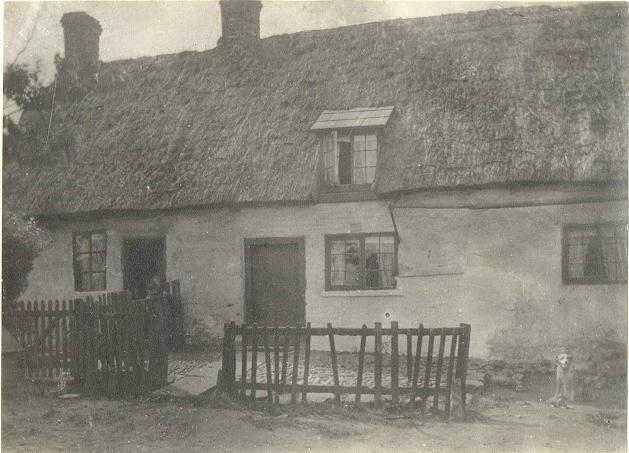 The first one I did was held at draughty Windy Ridge. We invited John, my family and our neighbours John and Yvonne Bowden. John Bowden was well known for his dry humour and direct way of speaking. He clearly had not expected much of an American thanksgiving dinner and when it was all over he pushed back his chair and declared 'Well that was better than I expected', high praise indeed! It was a typical wet Cheshire winter's night and the wind was howling up the Windy Ridge. Going into the kitchen to assemble the next course, I realised that I was not the only one to think that life inside was better than braving the elements outside, as a rather large frog hopped under the back door and snuggled up to the warm stove. Perhaps the fact that it didn't need to duck its head as it came under the door accounted for some of the cold draughts. Thanksgiving fare of course consists of roast turkey stuffed with chestnut and ordinary stuffing, Boston baked beans, red cabbage , sweet potatoes [yams] and pumpkin and pecan pies . Pumpkin pie was a new experience for the Brits at that dinner and was treated with some suspicion. It was declared to be 'OK if a bit medicinal'. I put this down to the cloves and ever since I have gone easy on the cloves! 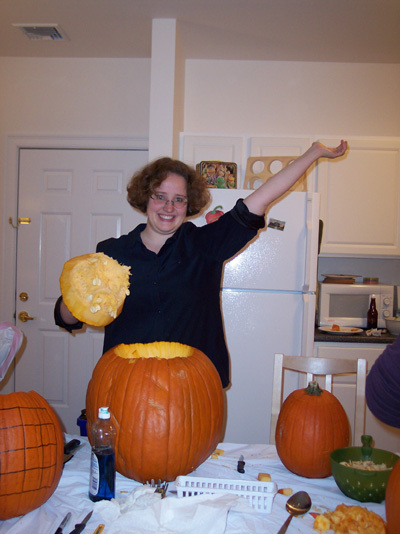 Last Halloween, Sj suffered from an attack of Excessive Jack-o-lantern disorder and I've cribbed her Lj to show how to prepare the pumpkins for Halloween and Thanksgiving. 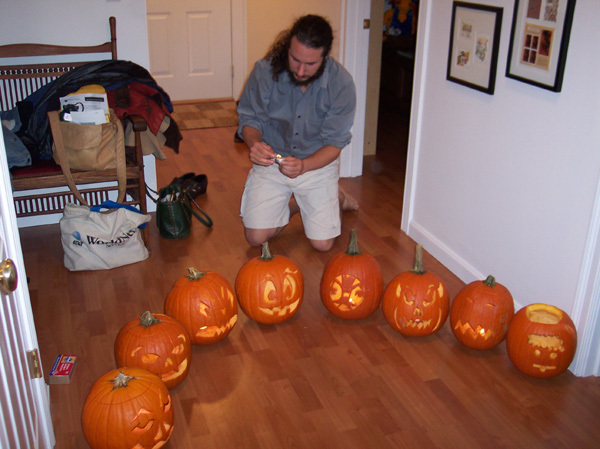 Decided to host a fairly impromptu Pumpkin Carving Extravaganza last night. Through a combination of coercion and bribes I managed to assemble the usual crowd. 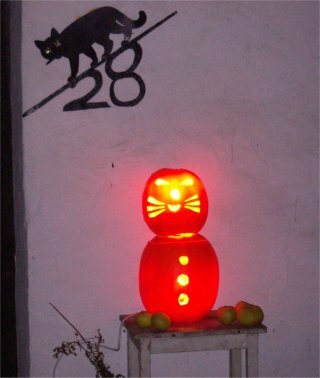 Food was consumed, pumpkins were cruelly slaughtered, a gigantic mess was made and much fun was had. 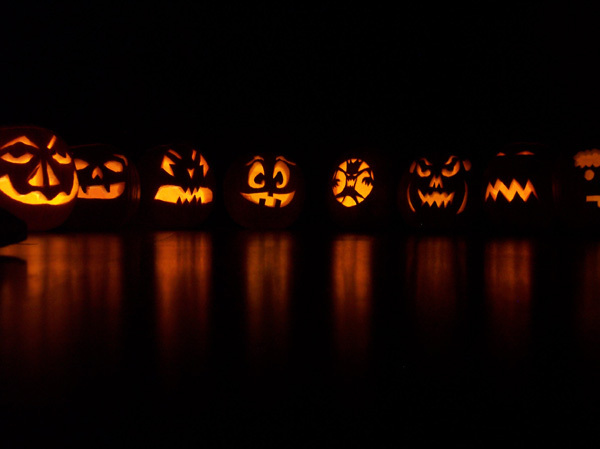 Decapitate the pumpkin, separate out the seeds, fibrous bits and the flesh. Boil the latter in a minimum of water until it can easily be mashed. Mash and freeze for pies or soup. Large pieces are excellent in a vegetarian Tagine. Combine all the ingredients except the milk and cream and then stir in the milk and cream mix. Cool and serve with whipped cream. You can use self raising flour or baking powder instead of the bicarb and tartaric acid. None of these shortcuts are much use on Cribbit as none survive active for very long. Rub the butter into the sugar and then add the flour and mixed fruit. Now I have digital scales [how the boy has fallen!] its so easy as you just bang everything in the bowl after the butter and sugar are mixed and then add the milk by weight and not volume. grammes for millilitres. The metric version makes about 14 scones, 12 from the Imperial measurements. Tw and I spent our first Christmas on Cribbit in 1993, he joined me at the end of term and we had much discussion as to what our Christmas menu should be. 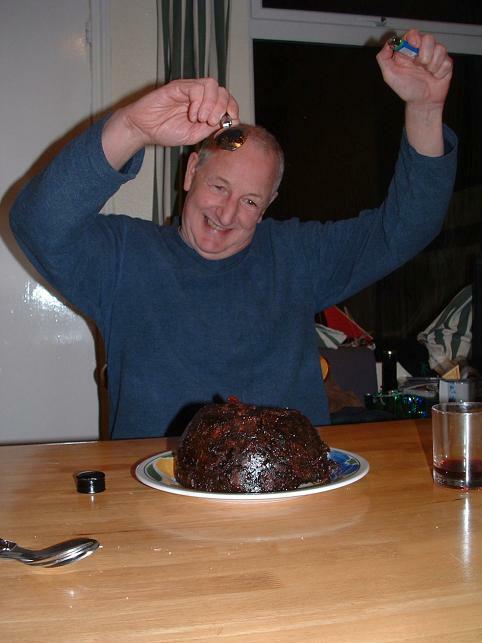 We settled on his choice which was pizza, and we had a good hot one, and Christmas pudding. This presented a bit of a problem as we only had days not months to go, so we surfed up this recipe which does not need to mature so long. Mix the fruit, nuts, sugar, spices and breadcrumbs together and rub in the butter. Beat together the wet ingredients and add to the fruit and stir well with many wishes. Transfer into well buttered pudding basin. There must be room for the pudding to expand. Cover and boil in a water bath for at least 4 hours. On Christmas day boil up again for 1-2 hours. Turn out and serve with flaming brandy. In October 2010, Jim and I took Cribbit out for a few days, we headed towards Paddington in the hope that we would see the electric classroom barge that he had designed AND Islington tunnel where it got stuck. I won't say that our navigation of the tunnel was only for research purposes as I must admit that the proximity of its further end to the Wenlock Arms may well have been a factor. Our 'on-the-go' coffee was much improved through being accompanied by slices of fresh fruit cake that Liz had made the weekend before and Jim had appropriated for shipboard use. Now one of the ingredients of this marvellous cake is sloes and Jim said that they had been in short supply around them this year. Remembering the 'carpets of snow' photographs of the blackthorn along the cut in the spring and the laden bushes up in BIG CAT land I decided that finding sloes would not be so difficult. On my way back, I pulled over and picked half a kettle full. 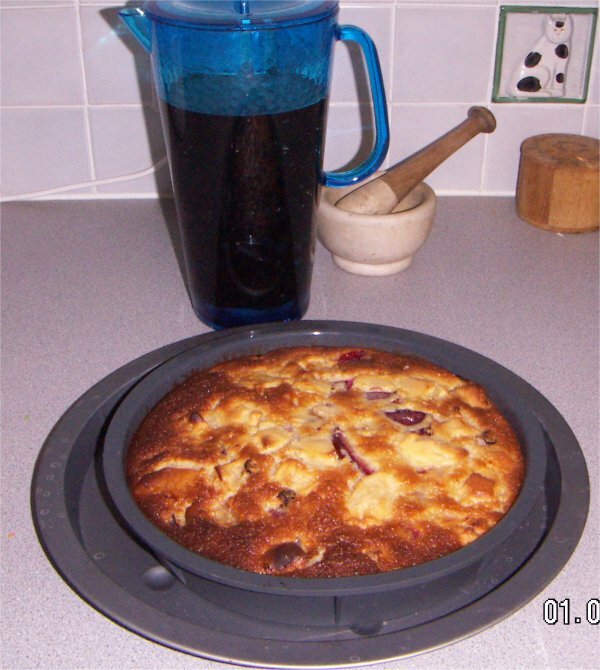 Most have gone towards the making of sloe gin, but a good handful went into this cake. I used 2 plums, one sour apple, a few prunes and a good handful of sloes. Set the oven to 175°C (350°F). Sift together the flour, salt, baking powder and vanilla sugar. Put milk and butter in a saucepan and bring to a boil. Pour in the beaten eggs and then add to the flour mixture. Add the fresh fruit, stir well and bake for about an hour by when an inserted knife should come out clean. I have a rather strange, floppy, baking dish, supposedly non-stick. 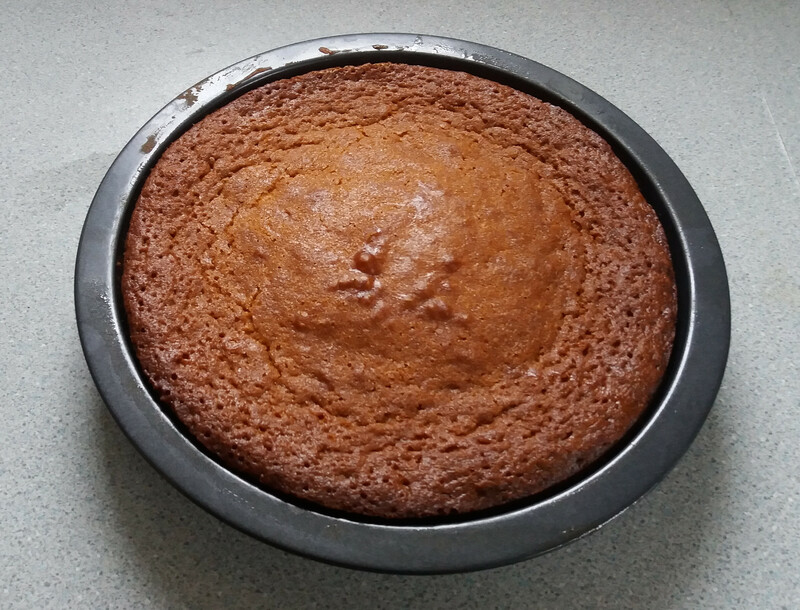 The fruit makes this a very sticky cake and this baking dish is just the thing as the cake can be extracted fron it despite its determination to stay where it is. You do need to remember to put the dish on a baking sheet though otherwise it becomes a Salvador Dali sculpture! You can just see my measurig 'cup' as well, it is a randomly chosen mug! 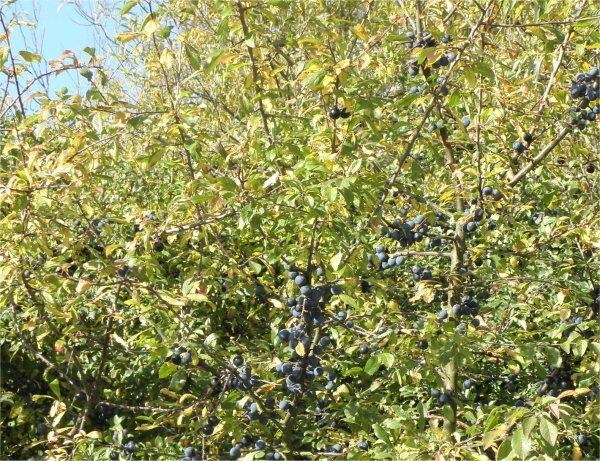 In the background, you can just see this year's sloe gin in the making. I used cranberries in the cake this time, as a good substitute for the sloes, but they will make their re-appearance in cakes nearer Christmas when the gin has been decanted leaving their little alcoholic selves available for cakes. When done, dust with icing sugar. 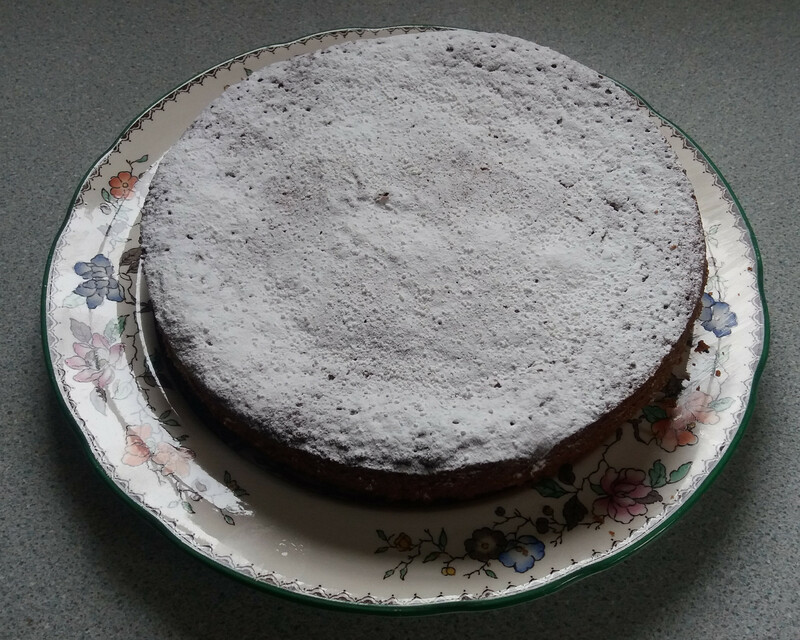 Actually, I call this Ann's honey cake, this is because she gave me the recipe and because she made it often in her last couple of years and I always think of her when I make it. It is quite simple to make, which is why she could manage it and I'm afraid to say that that is what I like about it too, being just about within my capabilities in cake baking. Pre-heat oven to 160 C and butter a 18cm diameter cake tin. Remove from the heat and mix in the eggs, flour and baking powder. Cool in the tin and then turn out onto a wire rack. Either ice the cake with icing sugar, more honey and warm water OR dust with icing sugar. These used to be a favourite when we lived on Grand Island and didn't have to worry too much about our waistlines. It's a recipe that evolved from an original in Joy of Cooking. As its American, its units of measurement are cups which are a real pain when you try to measure butter so I've converted it to metric pounds. Adjust the spices to taste. The solid pieces of ginger are excellent. Mix the ingredients. 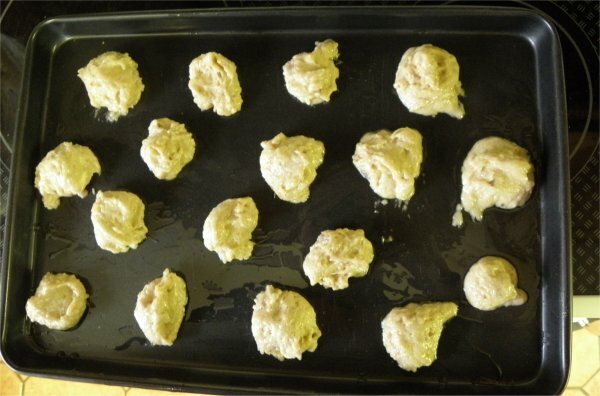 Drop in blobs on a greased cookie sheet and bake for about 12 minutes at 325F [165C]. 1 cup of butter is 8oz, so ¾ cup 6oz so its ¾ of a half a pound block of butter or a bit less of a 250g metric block of butter. If using British syrup, dilute it with its own volume of water to get the equivalent of American syrup. It used to be quite difficult to find mace in British shops, I'm told it is made from the outer layer of the nutmeg. Nutmeg is quite suitable as an alternative. I have noticed that mace is available in Asda now they are 'part of the Walmart family' and they also have other US type ingredients as well. They are less strong when it comes to continental europe ingredients though. On one memorable occasion, I found that we had no bicarbonate of soda, its purpose is to react with the vinegar to generate carbon dioxide so the cookies rise. So what else could I use instead? Well Rennies [antacid tablets] are meant for just the same job and maybe their pepperminty flavour will work well with the ginger. Well let me tell you IT DID NOT!